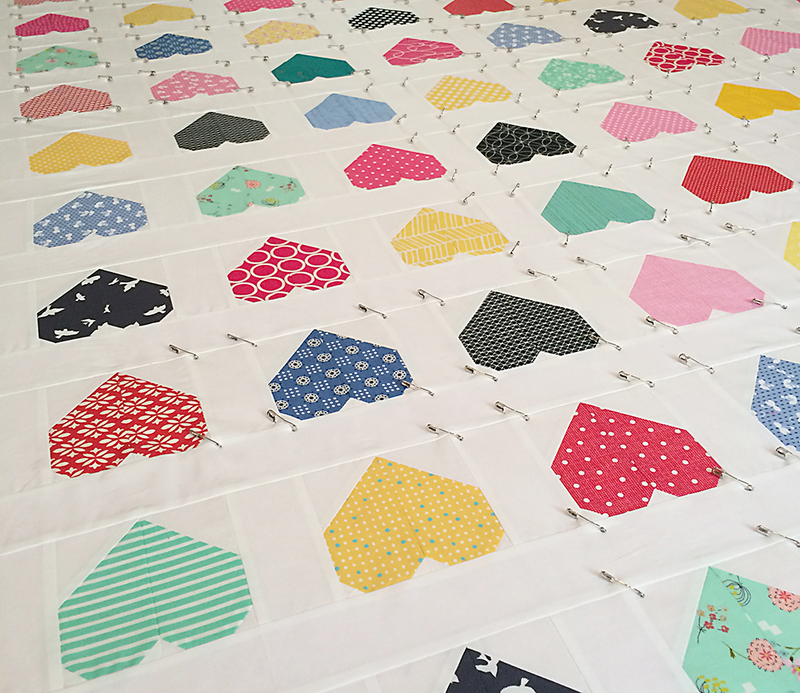 So speaking of Hanna Hearts, yesterday I spent 6 hours basting, quilting and binding. And it is D-O-N-E! I can't wait to get some finished pictures this weekend in the glorious weather. I quilted it with wavy lines. This is the sort of moment that I just love my BERNINA 750QE and it's visual screen. You can see I have stitch #4 selected, and as I changed the stitch width length (duh, don't recommend writing blog posts pre-coffee!) to 4.0 with the dial, the screen actually changed to show me how the stitch would look. I'm a visual learner, so this makes me really happy! I also mentioned that I finished up quilt blocks for a future tutorial. That's a sneak peek up there. This will be online very soon at BERNINA's We All Sew blog. I am *super* excited about this quilt. I started out with one idea for the quilt top layout and it completely transformed on my design wall. This seems to happen with my quilts more often than not. If you like scrappy and modern, I think you will really like this quilt tutorial! And finally, for those of you that live in the EU...I know it's been a few months of "no patterns" for you in my shop because of the new VAT laws over there. Well Etsy has announced that they are going to be handling collecting and submitting VAT for digital sales (read more here and in the featured comments on their post), so I have reopened my Etsy shop with digital patterns. If you are located in the EU, please use the Fresh Lemons Quilts Etsy shop rather than my blog pattern shop. Ok, back to work - I've been busy but there still is much to do!